It’s that time again, the State Fair is in full swing, and summer is drawing to a close. What a summer it was for the MGTA! In August, our annual golf event sold out as we drew an unprecedented number of golfers to the course. I was thrilled to see a diverse group this year, and many first-time attendees. Special thanks to John Novak and all of the committee members for their hard work in organizing our golf event each year. Our committee members work hard behind the scenes to make each of our seminars, events and networking opportunities happen. These hardworking volunteers are the life-blood of the organization, and are what make it great. As we continue to grow, help is always needed to ensure we accomplish our goals. Our committees are always looking for volunteers, and MGTA board elections will be coming up this winter. Please let me know if you’re interested. We have a busy fall schedule of programs. On September 15, the MGTA will host a member networking lunch focused on EAR & ITAR Rules on Cloud Computing, an interesting look at export controls in the digital age with speaker Ann Thomas. We also look forward to our next seminar on September 24, focused on the November rollout of ACE; join us to get an overview of the program, and how it will affect you. We look forward to seeing you there! MGTA Member Networking Lunch: "EAR & ITAR Rules on Cloud Computing"
MGTA EVENT: Are You Ready for Mandatory Transition to ACE? Speaker: Dr. Don Keysser, CM&AA, Hannover Ltd. Longest Putt: Tony Franciscus, BarOle Trucking, Inc.
And a huge Thank You to all of our sponsors! Goody-Bag Sponsor: Bremer Bank N.A. Hole-In-One Sponsor: Hamburg Sud North America, Inc.
Margarita Hole Sponsor: Hyundai Merchant Marine Co., Ltd.
On the U.S. West Coast, extra land for multimodal operations with any type of on-or-near-dock deep water, intermodal rail access and warehousing capacity is an especial rarity. In Oakland, Calif., the exception to the rule appears to be taking shape with the Oakland Global Trade and Logistics Center ─ a “logistics cluster” that will inhabit approximately 360 acres when fully developed. The public-private project, with an estimated cost of $1.2 billion, grew out of what had been the former Oakland Army Base that closed in 1993. The Oakland Global development commenced construction in October 2013 and will include: a $100 million intermodal rail yard with 16 parallel tracks that stretch 4,000 feet with projected capacity for 200,000 containers; a $250 million, 34-acre bulk shipping terminal capable of handling more than seven million metric tons of commodities; approximately one million square feet of new warehouse space and other planned improvements, such as 30 acres of truck parking and support services. Congestion has been a persistent problem at Oakland. Employers have been unable to hire enough International Longshore and Warehouse Union workers to operate yard trucks. ILWU Local 10 wants employers to add more registered longshoremen who are eligible for full benefits. Outside of labor issues, imports extended their growth streak to five straight months at the Port of Oakland in July, where containerized import volume jumped 8.7 percent last month from a year ago. To increase competitiveness, the Port of Oakland also recently proposed “OakPass.” It's modeled on Los Angeles and Long Beach terminals’ “PierPass,” created a decade ago to finance operation of night and weekend gates. Oakland marine terminals are seeking FMC authority to impose a fee on weekday truck gate moves to offset the cost of Saturday or off-peak hours. The planned fee would be $17 for a 20-foot container or $34 for other sized boxes. Empty containers, chassis and transshipment cargo would be exempt. In the case of LA/Long Beach, these fees have been very successful and off-peak gates now handle 44 percent of the ports’ truck moves. China: The End or the Beginning of an Era? French economist Thomas Piketty's 2013 bestseller, Capital in the Twenty-First Century, examines economic inequality in the West since the 1700s and argues things are only likely to get worse. He dismisses Western fears of Chinese power and argues that despite difficulties, China’s economic future is full of promise1. Fast forward to Tuesday, August 11, 2015 when China’s central bank moves to devalue its tightly controlled currency, causing its biggest one-day loss in two decades2. As the Wall Street Journal expected, “the engineered fall in the yuan was likely to cause political ripples around the world.” Less than two weeks after the devaluation took place, stocks plunged across Asia and U.S. index futures signaled more losses as the selloff in commodities deepened, sending South Africa’s currency toward its biggest drop in two years3. Whatever the case may be, Beijing’s struggles this summer have spooked many investors into viewing China as a threat to, rather than a rescuer of, global growth. During the financial crisis of 2008 and early 2009, China, with a colossal stimulus plan, acted as a shock absorber. Lately, it is China that is providing the shocks5. All of this instability ended up peaking on Monday, August 24, when U.S. stocks saw one of the most volatile days in history, including the Dow Jones Industrial Average making multiple 500-point swings in a single session6. So, does the U.S. “have to do something to rein in China” as suggested by presidential candidate Donald Trump? Or is what’s happening now in China going to benefit U.S. companies in the end? Anne Stevenson-Yang of J Capital Research, who has lived in Beijing for about 25 years and who counsels investors in China, was interviewed by Steve Inskeep on NPR on Friday, August 21. She believes that the short-term effects of this market correction will negatively impact the bottom line of U.S. companies that derive significant profit from China, because they will have less profit from China since they will have to repatriate it at a disadvantageous rate. And those that export commodities to China will have to export at a more disadvantageous rate. But over the longer term, she thinks what this signifies is that the Chinese government becomes less able to support and subsidize its preferred companies. This in turn means that Chinese companies will have to start competing on a more equal footing7. Mr. Piketty may have a point after all, and China’s better days may be ahead of us. 1David Volodzko, The Diplomat – January 30, 2015. 2Lingling Wei, Wall Street Journal – August 11, 2015. 3Emma O’Brien & Nick Gentle, The Korea Herald – August 23, 2015. 4Shinichi Saoshiro, The Times of India – August 24, 2015. 5Lingling Wei & Mark Magnier, Wall Street Journal – August 23, 2015. 6Alex Tribou & Dashiell Bennett, Bloomberg – August 24, 2015. 7 Anne Stevenson-Yang interviewed by Steve Inskeep & David Greene, hosts of Morning Edition on NPR – August 21, 2015. The potential merger of China Shipping and Cosco would make the newly formed Chinese carrier the top player in the trans-Pacific eastbound trade, according to an analysis of PIERS data. A merger looks increasingly likely after both companies suspended trading on the Shanghai, Shenzhen and Hong Kong exchanges recently in preparation of a joint announcement. A China Shipping-Cosco merger would create the fourth-largest global container line, after CMA CGM, at No 3; Mediterranean Shipping Co., at No. 2; and Maersk Line as the biggest. A combined carrier wouldn’t run afoul of the U.S. Federal Maritime Commission (FMC) unless it was found to violate the Shipping Act by likely causing an unreasonable decrease in service, an unreasonable increase in costs, or both. The FMC becomes directly involved in container line mergers only if both companies are U.S.-owned, as in the case of the discussed but never-completed 1970 merger of Sea-Land Service and now-defunct United States Lines. That doesn’t mean FMC commissioners aren’t watching the developing story closely. FMC Commissioner William Doyle has asked the Chinese Ministry of Transport to add an agenda item on the potential merger to a bilateral discussion between maritime regulators in a Shanghai suburb in early November. European Union regulators aren’t expected to take a closer look at the potential merger unless the newly formed carriers’ share on the Asia-Europe and trans-Atlantic trade lanes exceed 30 percent for each. It’s not known the exact share Cosco and China Shipping control on the highly competitive Asia-Europe trade lane, but both carriers’ share on the trans-Atlantic trade lane was in the low single digits in the first half of 2015. The harder question to answer is whether the merger would reduce competition on the three major east-west trade lanes. Carlton, however, said he understands why the two money-losing carriers might be looking to merge. Shippers may hope that a newly formed carrier might be more financially stable and give better service, but such a merger wouldn’t solve carriers’ problems with overcapacity in the market, he said. Judging by their market share in the first half in laden containers shipped from China to the U.S., the merger of China’s top two state-owned carriers would create a carrier with control of 12 percent of the eastbound trans-Pacific market, as Cosco had a 7.1 percent share of laden volume and China Shipping had a 4.9 percent share. That’s a decrease from Cosco and China Shipping’s share in the first half of 2014, at 6.6 percent and 4.8 percent, respectively. If trans-Pacific eastbound market share remained roughly the same, Evergreen would be bumped to the carrier with the second-largest share, as it handled 10.9 percent of laden volume in the first six months of this year. A merged China Shipping and Cosco would control slightly less than 8 percent of laden volume moving on the far less profitable westbound route, according to statistics from PIERS, a sister company of JOC.com within IHS. In comparison, a newly formed company would control only 1.9 percent of U.S. imports on the trans-Atlantic trade lane, where Cosco has a 1.46 percent share and China Shipping handes just 0.4 percent of the trade. The newly created carrier would control slightly less than 1.3 percent of laden volume moving from the U.S. to Europe, according to an analysis of first half 2015 statistics. The merger could also have ramifications for the Canadian container trade and U.S.-bound cargo flowing through Canada. Cosco is the main carrier serving the gateway that is increasingly handling cargo bound for U.S. markets. It’s also unknown what a merger would mean for the major shipping alliances that China Shipping and Cosco are members of. If Cosco were to join China Shipping in the Ocean Three Alliance, which includes CMA CGM and United Arab Shipping Co., the alliance would expand its share of the eastbound Trans-Pacific market to the U.S. from 12 percent to 17 percent, according to first-half laden volume statistics from PIERS. If the reverse happened and China Shipping joined its smaller Chinese counterpart in the CKYHE Alliance, the alliance — involving “K” Line, Yang Ming, Hanjin Shipping and Evergreen Line — would boost its share on the same direction of the trade lane from 27.1 percent to 30.5 percent. Or China Shipping and Cosco could leave their respective alliances, potentially triggering another round of musical chairs. Any changes to vessel-sharing agreements affecting U.S. trades would require FMC approval. The Greek economic bailout, while no longer making front page headlines, is far from over. We will examine the impact that this economic crisis is having on the Eurozone and beyond. In 2002, Greece join the Euro. Simultaneously, the Greek government increased public debt owing to the stability of the European currency. The 2004 Olympic Games added to the public debt, which worsened after the 2008 crash. In 2009 the Greek government revealed that public debt was at 113% of GDP. By understating its deficit figures for years, this raised alarms about the soundness of Greek finances. By 2010 Greece was veering toward bankruptcy, which threatened to set off a new financial crisis. In 2010 the International Monetary Fund, the European Central Bank and the European Commission (known as the troika) issued the first of two international bailouts for Greece. This totaled more than 240 billion euros, or about $264 billion. The Greek economy has shrunk by a quarter in past five years, and unemployment is above 25 percent. The money was supposed to buy Greece time to stabilize its finances and quell market fears that the European Union itself could break up. Although Greece does not have to make any payments on that debt until 2023 (IMF has suggested extending to mid-century), it is not out of the woods just yet. The money is mainly going to pay off Greece’s international loans, rather than making its way into the economy. And the government still has a staggering — as much as double the country’s annual economic output — debt load that it cannot begin to pay down unless a recovery takes hold. By not needing to make payments for decades to come by the time the money came due, the Greek economy could have grown enough that the sum no longer seemed daunting. Currently there are no provisions for departure, voluntary or forced, from the Euro currency union. Exiting the Euro and EU involves a legal minefield that no country has yet ventured to cross and currently there doesn’t seem to be any political will on either side for Greece to exit. There are currently two views if Greece were to exit. Should Greece declare bankruptcy, it would weaken investor trust, affect banking in the region, and see financing costs for member countries with the most debt go through the roof. This would lead to a profound economic crisis in the EU and Greece returning to its old currency, the drachma. Some believe that if Greece were to leave the EU, it wouldn’t be such a catastrophe. Europe has put up safeguards to stop the spread to other countries. Greece is just a tiny part of the EU, about the size of Louisiana. By leaving, some say the EU would actually be better off without a country that seems to be constantly in financial crisis. HONG KONG — Operations at two container terminals in the port of Tianjin have been suspended following the massive blast at a dangerous goods warehouse that reportedly killed more than 100 people and injured hundreds. IHS country risk analyst David Yang said two container terminals in the Beijiang area of the port where the explosion occurred on August 12 were confirmed to have been shut down — Cosco Pacific’s Wuzhou Five Continents International Container Terminal at the eastern-most end of the Beijiang port area with four berths, and Euroasia International Container Terminal with three berths. Euroasia is a joint venture between the Tianjin Port Authority and Maersk subsidiary APM Terminals, although a spokesman for APM Terminals said the explosion was three miles from its facility. “No impact to our port or operations — the port is open and vessels working today,” he said. A spokesman for Singapore operator PSA International had a similar comment. “Operations at PSA's joint venture container terminals in Tianjin were not affected by the earlier explosions in the port area,” he said. 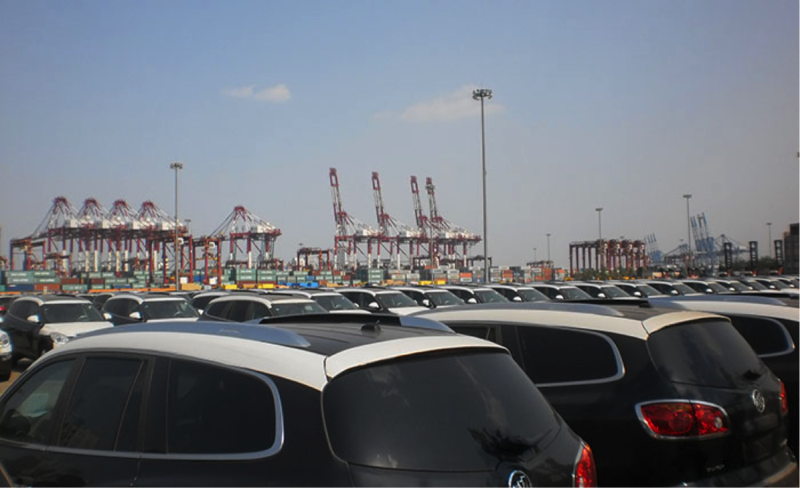 PSA has a joint venture with Tianjin Port Group at two terminals, Tianjin Port Alliance International and Tianjin Port Pacific. Tianjin Port Development, the Hong Kong-listed arm of the Bohai Rim gateway, also said it was business as usual at the port. “Currently, port operations of the group are normal. Based on the preliminary assessment, the group anticipates the accident will not cause any material loss to the group,” Tianjin Port Development said in an announcement to the Hong Kong Exchange. The port suspended trading soon after the bourse opened pending an investigation into the extent of the damage, no doubt to avoid over-reaction by investors already jittery after China’s recent stock market rout and the sudden devaluation of its currency. According to Tianjin port, the explosions started at 11:20 p.m. at a warehouse for dangerous materials owned by Rui Hai Co. (Tianjin Dongjiang Port Rui Hai International Logistics), which is located in Dongjiang Bonded Area of Tianjin port. It emphasized that the logistics operator was not part of the port group. State broadcaster China Central Television (CCTV) said the blasts were from a shipment of explosives, with state news agency Xinhua reporting that the first explosion was equivalent to 3 tons of TNT and the second blast 21 tons of TNT. The blast had a radius greater than a mile and could be seen by satellite. Tianjin is China’s largest vehicle importing port, and images show thousands of new cars lying smashed in neat rows across multiple parking lots. Stacks of containers also lie scattered. The explosion completely destroyed buildings and blasted the roofs of others. Of great concern to shippers will be the extent of damage to cargo being shipped through Tianjin. The port is the sixth-busiest in China and handled 7.2 million TEUs in the first half, a 5 percent increase on the first six months of last year. Tianjin was the second-most productive port in the world behind Dubai’s Jebel Ali, according to JOC.com’s Port Productivity Rankings. The port was tied for first place with its Chinese counterpart Qingdao for the most productivity in terms of ships over 8,000 twenty-foot-equivalent units. Cargo casualty management firm WK Webster said because of the huge amount of damage to property, including import and export cargo, it had placed a team of surveyors on standby to conduct inspections as soon as the site was declared safe. This article was compiled using information from bbc.com. 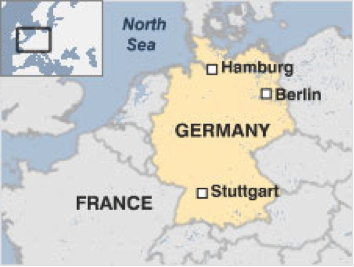 Achieving national unity later than other European nations, Germany quickly caught up economically and militarily, before defeats in World War I and II left the country shattered, facing the difficult legacy of Nazism, and divided between Europe's Cold War blocs. Germany rebounded to become the continent's economic giant, and a prime mover of European cooperation. With the end of the Cold War, the two parts of the country were once again united, although the economy of the former east continues to lag behind that of the former west. Dome of the Reichstag rises over Germany's resurgent capital, Berlin. 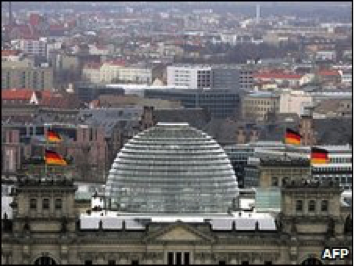 Germany's economic success since World War II is to a large extent built on its potent export industries, fiscal discipline and consensus-driven industrial relations and welfare policies. It is particularly famed for its high-quality and high-tech goods. Germany's export-dependent economy was initially hit hard by the global financial crisis of 2008-9, which triggered the worst recession since 1949. But by 2010, its exports had helped the country to rebound more robustly than most other EU members. However, an aging population has led to concern over the continued viability of Germany's high welfare and health spending. There is also a debate about how to improve integration of the many post-war immigrants whose labour helped fuel the economic boom. In addition, what was once the German Democratic Republic, the former Soviet-dominated east, has struggled to catch up with the more affluent west after reunification, while people in the west had to pay a higher than expected financial price. In the 1950s Germany was one of the six founding nations in the original European Economic Community from which the European Union was eventually to develop and in which Germany is a key player. Franco-German cooperation was central to European economic integration in the 1980s and '90s. Mr. Gauck describes himself as a "liberal left conservative"
Mr. Gauck stood for the largely ceremonial presidency in 2010, losing to the government's preferred candidate Mr. Wulff. Mr. Gauck, like the Christian Democrat chancellor, Angela Merkel, has a background in the Lutheran Church in East Germany — he was a pastor there, as was Mrs. Merkel's father. An active anti-Communist from an early age whose father was exiled to a Soviet forced-labour camp for several years, Mr. Gauck was a leader of the opposition New Forum in the last days of the East German dictatorship. Mr. Gauck describes himself as a "liberal left conservative", and has expressed support for the policies of both Social-Democrat and Christian-Democrat coalition governments on a non-partisan basis. 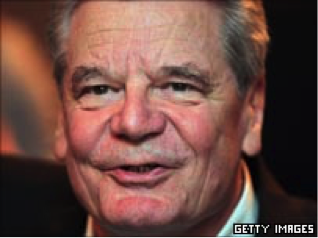 Born in Rostock in 1940, Mr. Gauck has four children by his wife, from whom he is separated. His partner since 2000 is the journalist Daniela Schadt, who will take on the ceremonial duties of First Lady. Mrs. Merkel, leader of the conservative Christian Democrats (CDU), first took office in an 2005. As a result of the vote's close result, she became chancellor in a "grand coalition" involving the CDU, its Christian Social Union (CSU) allies and the centre-left Social Democratic Party (SPD). The coalition faced the tough challenge of dealing with the fallout from the 2008 global economic crisis. Mrs. Merkel won plaudits for her calm handling of the situation, but her ability to weather a storm was put to an even more severe test once the full scale of the crisis in the Eurozone began to emerge early in 2010. In May 2010, Mrs. Merkel's coalition lost a key regional vote, and with it her majority in the powerful upper house of parliament, the Bundesrat. The following March, her party also lost the key state of Baden-Wuerttemberg, traditionally a CDU stronghold. 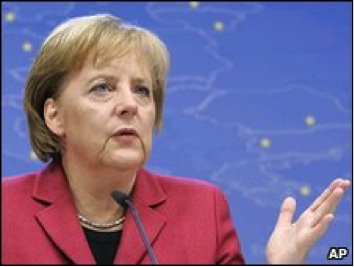 In December 2011, Mrs. Merkel told the Bundestag that Europe was working toward setting up a fiscal union in a bid to resolve the debt crisis. But she also also reiterated her opposition to the European Central Bank issuing "eurobonds" backed by all eurozone members. Angela Merkel became leader of the CDU in 2000 after her predecessor Wolfgang Schaeuble resigned in connection with the party funding scandal that also tainted her long-time mentor, former Chancellor Helmut Kohl. She was born in Hamburg in 1954 but grew up in East Germany, where her father was a Protestant clergyman. She holds a doctorate in physics. She divorced her first husband Ulrich Merkel in 1982, and has been married to publicity-shy chemistry professor Joachim Sauer since 1998. She has no children. Germany's competitive television market is the largest in Europe, with some 34 million TV households. 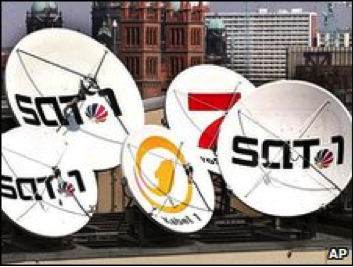 The many regional and national public broadcasters — organized in line with the federal political structure — vie for audiences with powerful commercial operators. Each of the 16 regions regulates its own private and public broadcasting. Around 90% of German households have cable or satellite TV, and viewers enjoy a comprehensive mix of free-to-view public and commercial channels. This has acted as a brake on the development of pay-TV. Germany is home to some of the world's largest media conglomerates, including Bertelsmann and the publisher Axel Springer. Some of Germany's top free-to-air commercial TV networks are owned by ProSiebenSat1, a consortium led by a U.S. billionnaire. While the press and broadcasters are free and independent, the display of swastikas and statements endorsing Nazism are illegal. There are several national newspapers, but the press market is strongest at a regional level, with more than 300 titles. Bild tabloid is the best-selling daily. By March 2011, nearly 80% of Germans — 65.1 million people — were online, Internetworldstats reported. The leading social network is Facebook, with more than 20 million users. Its rivals include wer-kennt-wen and meinVZ.